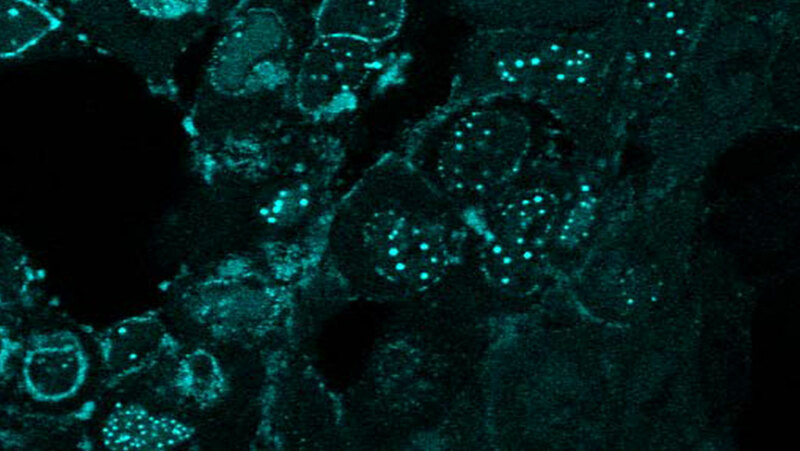 Fluorescence microscopy shows an HSV-1 genome engineered to express a fusion of viral protein VP16 and fluorescent protein Cerulean. Image by Peter Grzesik with assistance from The Johns Hopkins University Integrated Imaging Center. Researchers at JCVI have been developing synthetic genomics assembly methods since 2000, addressing fundamental biological questions. Together, with researchers at Oregon Health and Science University, Johns Hopkins University School of Medicine, Synthetic Genomics, Inc., and Vir Biotechnology, Inc. (formerly TomegaVax, Inc.), the team has made another major advance in this field. Building upon past advancements, a protocol has been developed whereby we are able to engineer genome variants of large DNA viruses by breaking the original genome up into smaller, overlapping pieces, that can then be independently modified, and then reassembled back into full-length virus genomes. This allows for quick assembly of genome variants that can be used to understand the function of genes and gene combinations in viruses. Previous genetic systems for large DNA viruses, such as herpesviruses and poxviruses, required you to make one change at a time, making the new system significantly more efficient. In our study, we used herpes simplex virus type 1 (HSV-1) and human cytomegalovirus (HCMV), both members of the herpesvirus family. Herpesviruses can cause a range of diseases and symptoms, including cold sores, congenital birth defects, and cancer. Herpesviruses have extremely large genomes. HCMV is about 230,000 base pairs, the largest genome of any virus known to infect humans, and carries over 100 genes. Many of the functions of these genes are not yet known. We believe that our system will allow for a combinatorial approach to herpesvirus genetics that was not possible previously. Rapid engineering of herpesviruses could also lead to new therapeutics and vaccines. For most herpesviruses, there are no effective vaccines. Improved genetics may allow us to rationally design and attenuate the virus, which would lead directly to vaccine strains. Herpesviruses could be developed as delivery systems for gene therapy. Herpesviruses could also be developed to treat cancer as oncolytic viruses, which are viruses that attack cancer cells. An HSV-1-based oncolytic virus has already been approved by the FDA to treat melanoma and rapid engineering strategies could help generate oncolytic viruses to treat other cancers. We believe this method to assemble and engineer virus genomes will be applicable to many different viruses and help expand our understanding of the basic biology of other viruses that are difficult to work with currently. You can read more about this in the two original papers, and a just published commentary.